Most social scientists and philosophers claim that sociology and philosophy are disjoint fields of inquiry. Some have wondered how to trace the precise boundary between them. Mario Bunge argues that the two fields are so entangled with one another that no demarcation is possible or, indeed, desirable. In fact, sociological research has demonstrably philosophical pre-suppositions. In turn, some findings of sociology are bound to correct or enrich the philosophical theories that deal with the world, our knowledge of it, or the ways of acting upon it. While Bunge's thesis would hardly have shocked Mill, Marx, Durkheim, or Weber, it is alien to the current sociological mainstream and dominant philosophical schools. Bunge demonstrates that philosophical problematics arise in social science research. A fertile philosophy of social science unearths critical presuppositions, analyzes key concepts, refines effective research strategies, crafts coherent and realistic syntheses, and identifies important new problems. 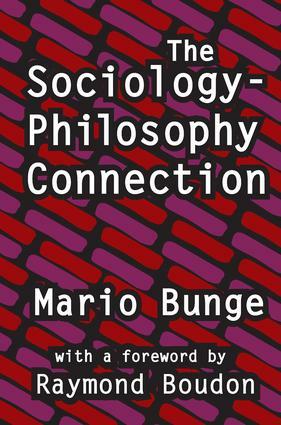 Bunge examines Marx's and Durkheim's thesis that social facts are as objective as physical facts; the so-called Thomas theorem that refutes the behaviorist thesis that social agents react to social stimuli rather than to the way we perceive them; and Merton's thesis on the ethos of basic science which shows that science and morality are intertwined. He considers selected philosophical problems raised by contemporary social studies and argues forcefully against tolerance of shabby work in academic social science and philosophy alike.